As a young, intrepid reporter (aren’t they all? ), one of the many beats I covered was the “cops and courts” beat in Bismarck, N.D.
Sgt. 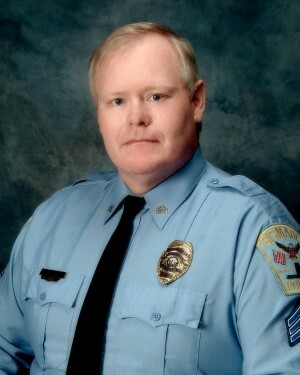 Steven Kenner, a police officer killed in the line of duty Friday. That meant schlepping into the police station every morning for daily briefings on all the crimes that happened overnight, and checking the police logs at night. Back then, I wasn’t nearly as bold as I am now, and as I’d tiptoe into the police station, I always hoped the cop on duty was one of the nice ones. There are those cops who acted like reporters were a menace to society, and those who were decent, and those who were downright fun. I remember Sgt. Steve Kenner fondly. He was a bear of a man — had to have been more than 6 feet tall — but you could tell the minute he opened his mouth that he was just a darn nice guy. He was shot and killed while responding to a domestic disturbance Friday night in Bismarck. He’d worked for the Bismarck Police Department for a whopping 32 years — and was surely nearing the end of his career, at age 56. He and his wife had three children. This marks the first time a Bismarck police officer was killed in the line of duty. Media reports indicate he was shot while approaching a man sitting in a van — a man who appears to be from Nebraska. I’ve ridden along with cops as they dodge pitbulls and track down prostitutes in the Near South, I’ve watched (cowered, is more like it) as they’ve knocked on the doors of drug suspects and stayed out the way as they dealt with drunks and drug addicts. I’ve sat (cowered) in an unmarked car with a sharpshooter while a SWAT team tried to talk down an armed man in an empty school bus. Just another day on the job, for them — but a life-changing experience for the tag-along reporter. Every time a cop so much as pulls over a car, there’s always that tiny possibility something could go terribly awry. I cannot imagine what it’s like to go through that every day, every shift, every hour, every minute. I could not handle the strain. Just this weekend, I was attending a dinner in Dallas where a reporter-in-training was regaling guests with stories about ride-alongs with cops. “I’ve been on a high-speed chase, and a low-speed chase,” he said proudly. I kind of chuckled inside, because he’s merely a reporter who wishes he were a cop — he’s not doing anything but tagging along and probably irritating the cops in the process. The cops reporters often have the best stories to tell in a newsroom — but it’s the actual cops, like Kenner, who deserve our admiration, respect and gratitude. They put their lives on the line every day, and we often forget that. This is really sad and senseless. It sounds like you were lucky to have known him.